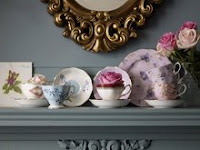 I love Shabby Chic, but not when it's too shabby (if you know what I mean). I still like vignettes to have a slightly finished look. 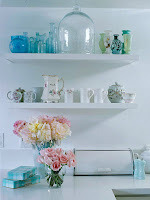 I adore these images by UK stylist Selina Lake. They still look clean and crisp, but with that charm that a little "vintage" ensures. This Better Home and Gardens image posted by The Glam Lamb says it perfectly- "clean, crisp, a touch of vintage, and ever so ever so pretty!" Love all that robins egg with the hit of pink! Oh yes, the robin's egg with pink! I love it too!! And that pink phone in the 2nd image is great!